This past September my husband and I had a trip planned to visit Miami, Florida. I had never been there and the opportunity to see a few of our favorite bands at an outdoor concert venue was too good to pass up! I remember when I booked the tickets I remarked to my husband that September would be a perfect time to be outdoors in Miami—barring a hurricane. Well, I guess you may have figured out some of what happened next. Her name was Irma. She was the category 5 hurricane which devastated, first the Caribbean, and then had its way with much of the state of Florida. Irma struck US soil the week before we were due to begin our Miami vacation causing massive power outages, flooding, roof damage, and downed trees. My husband and I were assured that our accommodations had electricity and that the concert was still scheduled to run, so we decided to keep our travel plans. Upon our plane’s approach to the Miami International Airport we could see hundreds of blue tarps covering the roofs of area homes. Driving to our lodging we found more of the same destruction which, now from our ground-based vantage point, included boarded up windows and hundreds of downed palm trees. The thing that caught my eye, as we drove alongside the wide spread damage, was the shallow and ineffective root system that was revealed at the base of each storm-toppled palm tree. Back home in the Northeast, one of the trees that dots our landscape is the great oak tree, which in sharp contrast to the palm tree, has a massive root system including a deep taproot that could run 10 feet deep below the soil’s surface. The revelation that I was looking at a visual picture of two types of Christians struck me. 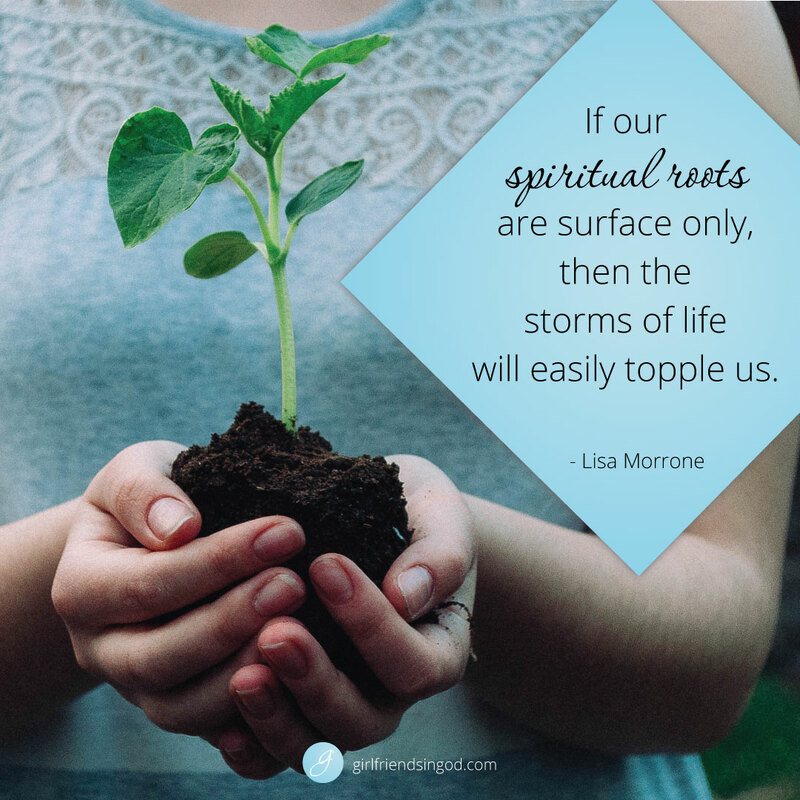 If our spiritual roots are surface only, then the storms of life will easily topple us, but if we grow an extensive root system, complete with a deeply planted taproot, then we will be able to withstand a much greater battering from the storms of life without losing our footing. So how do you, as a Christ-follower, go about establishing the root system of an oak tree rather than a palm tree? First, following your germination (salvation), you need to send down a strong taproot, which I believe is the assured knowledge that Jesus Christ loves you—completely and eternally. The more certain you are of His unconditional love for you, the deeper your taproot can extend. In order for the rest of your supportive root system to develop you need to continually nourish your life with prayer, Bible reading, and meditation. Finally, you must prepare the soil of your life in such a way as to not resist root growth. Bitterness and unforgiveness will stunt your root development for sure! Pour out grace upon those who have hurt and offended you as liberally as the Lord has poured it out upon you. 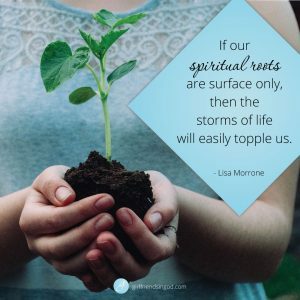 Father, I believe You love me…yet help me unearth any unbelief or distortions I may have about Your love for me, so I can more effectively establish a deep, spiritual taproot. Then Lord, would You gift me with the discipline required to pursue You so that the breadth and depth of my root system would not be lacking? It is for Your glory and for my good that I ask these things. Think back to the last personal storm you underwent—or maybe the one that is swirling around you right now. How firmly did your roots hold? If you felt downright toppled and your “roots” were left unearthed, then I believe it’s time for some serious root inspection. Which of the above elements might you be lacking in your knowledge and pursuit of Christ? Plan to take purposeful steps towards deeper root growth beginning this very day so that when you encounter your next storm you will neither fear nor worry. Get Healthy for Heaven’s Sake (Harvest House Publishers) is one of Lisa’s six books in her Restoring Your Temple® health resource collection. Her books are available on Amazon.com, barnesandnoble.com, or wherever books are sold. Good Morning and Thank You for Sharing this Message! I definitely want to develop a root system that is tapped into the love of God! I enjoy your Monday Morning Health Tips! God’s blessings always!! !